Some details of how this works have changed between then and now, but the basic insight remains all too timely. 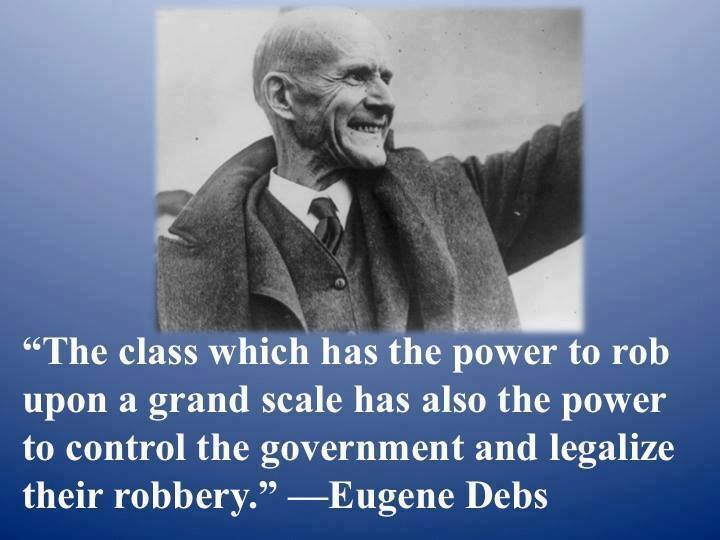 Eugene Victor Debs (November 5, 1855 – October 20, 1926) was an American union leader, one of the founding members of the Industrial Workers of the World (IWW or the Wobblies), and 5 times the candidate of the Socialist Party of America for President of the United States. 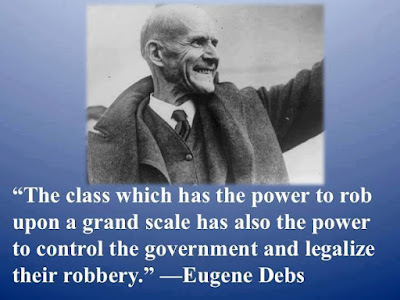 Through his presidential candidacies, as well as his work with labor movements, Debs eventually became one of the best-known socialists living in the United States. His highest popular vote total came in 1920, when he received about 915,000 votes. Ironically, he was in prison at the time, serving a sentence for having criticized the U.S. government’s prosecution of persons charged with violation of the 1917 Espionage Act, which made it illegal to speak out against the draft after the US entered the First World War. The 1918 speech from which that quotation was taken is here. Intelligent discontent is the mainspring of civilization. Progress is born of agitation. It is agitation or stagnation.